Well that certainly is an interesting way to cross a harbor. I can’t imagine why the Golden Gate beat out this design. Wouldn’t you feel completely safe driving through a “boat tunnel”? 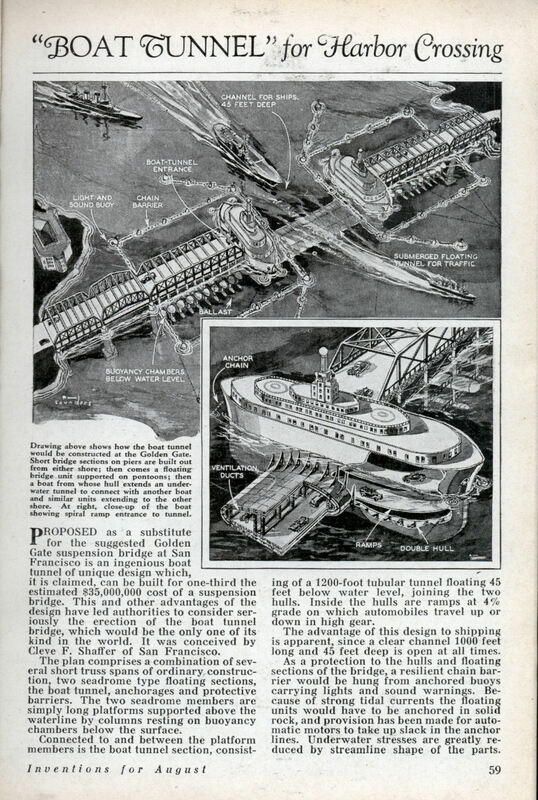 PROPOSED as a substitute for the suggested Golden Gate suspension bridge at San Francisco is an ingenious boat tunnel of unique design which, it is claimed, can be built for one-third the estimated $35,000,000 cost of a suspension bridge. This and other advantages of the design have led authorities to consider seriously the erection of the boat tunnel bridge, which would be the only one of its kind in the world. It was conceived by Cleve F. Shaffer of San Francisco. The plan comprises a combination of several short truss spans of ordinary construction, two seadrome type floating sections, the boat tunnel, anchorages and protective barriers. The two seadrome members are simply long platforms supported above the waterline by columns resting on buoyancy chambers below the surface. Connected to and between the platform members is the boat tunnel section, consisting of a 1200-foot tubular tunnel floating 45 feet below water level, joining the two hulls. Inside the hulls are ramps at 4% grade on which automobiles travel up or down in high gear. The advantage of this design to shipping is apparent, since a clear channel 1000 feet long and 45 feet deep is open at all times. As a protection to the hulls and floating sections of the bridge, a resilient chain barrier would be hung from anchored buoys carrying lights and sound warnings. Because of strong tidal currents the floating units would have to be anchored in solid rock, and provision has been made for automatic motors to take up slack in the anchor lines. 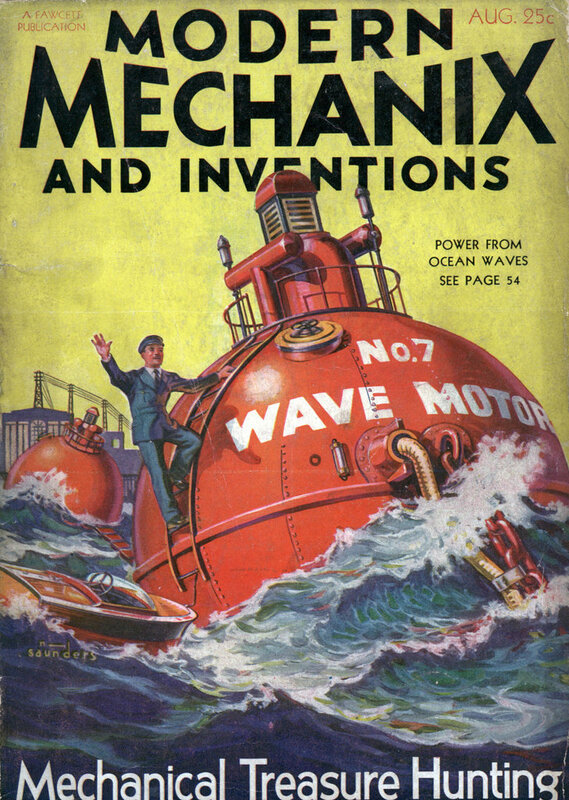 Underwater stresses are greatly reduced by streamline shape of the parts. Cleve F. Shaffer, an inventor and somewhat of a prophet, who saw into the future but did not always profit by it, died on October 27, 1964, six weeks before his 80th birthday. He lived at the Fontana Apartments luxurious tower in San Francisco and he developed “Tai Shan”, his country estate near Los Gatos, California, into an astonishing showplace. He was recognized by “Janes Airships”, the authoritative British journal, as the leading aviation figure in the United states in 1911. He foresaw the tank, the bazooka, and the moving sidewalk, though he failed to win fame from any of them. Mr. Shaffer concentrated on the airplane and the rocket. He made his first solo flight in a glider under the instruction of Professor Montgomery, on December 23, 1907, and his first solo flight in an airplane, on December 17, 1910, at Palo Alto, Calif., in a field near the Bay. He was a member of many organizations. He was one of the first five members of the International Planetary Society, honorary President of the San Francisco Soaring Society and founder of the National Tank Defense League. He wrote a book “The Idiot Hope In The Night” and he had two exhibits in the Smithsonian Institution in Washington, D. C.
Surviving him is his sister Mrs. John C. Parsons of San Francisco. I think if you have an apartment in a luxury tower *and* a country estate, you can’t be said to have not profited from your work. Reminds me of the Oresund Link. That thing is really cool looking. However the word in it’s name you left out is FIXED I have no problem with a bridge/tunnel, it’s the floating tunnel part that scares the bejesus out of me.